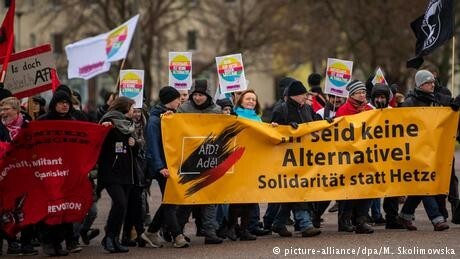 Placards and banners carried by AfD detractors included the slogan "Racism is no alternative," playing off the party's name. Police said they intervened when a roadside bystander made a Hitler salute. The anti-migrant, euroskeptic AfD, launched in 2013 and now holding opposition seats in all of Germany's 16 regional assemblies as well as the federal Bundestag, had begun its four-day convention on Friday in Riesa to complete its list of party members who could serve in the European Parliament following this year's European elections. But the AfD required six run-off ballots and an overnight adjournment to choose its latter placeholders — on top of 14 front-runners decided last November — including former Christian Democrat Michael Adam, from Berlin, and Martin Schiller from the western state of North Rhine-Westphalia. The procedural delay prompted AfD co-chairman Jörg Meuthen, who will head the AfD's European list on May 26, to urge delegates to wrap up discussions with enough time to formalize the party's European campaign manifesto before the convention ends on Monday. One draft AfD proposal postulates a German departure from the EU within five years if AfD-desired reforms fail to occur. Meuthen reportedly wanted that time frame reformulated to read "in reasonable time." Overshadowing the AfD convention was Friday's announcement by Andre Poggenburg, a once-prominent firebrand AfD leader in the state of Saxony-Anhalt, that he intended to form a rival party named the Awakening of German Patriots. Poggenburg said the new party was likely to contest Germany's three eastern regional assembly elections due in Saxony and Brandenburg in early September and Thuringia in late October. He displayed its logo, a blue corn flower that was used as code in Austria by Nazi sympathizers before the nation's annexation by Adolf Hitler's Germany in 1938. On Friday, Alexander Gauland, who co-leads the AfD in the Bundestag, retorted that it was "very unlikely that anyone will follow [Poggenburg] from our Bundestag caucus into political irrelevance." Separately, ahead of September's poll in Saxony, that state's Social Democrats (SPD) on Saturday picked their regional chairman Martin Dulig as their lead candidate. Dulig is Saxony's economy minister and its deputy premier in a coalition Cabinet led by Christian Democrat Premier Michael Kretschmer. Surveys in Saxony currently put Dulig's SPD at about 10 percent, Kretchmer's CDU at 29 percent and the region's AfD at 25 percent. Manfred Güllner of the Berlin-based political survey agency Forsa on Friday said Chancellor Angela Merkel's successor as federal CDU chair, Annegret Kramp-Karrenbauer, had achieved "high approval ratings" similar to Merkel's. At a Berlin gathering of Germany's ex-communist Left party on Saturday, co-chair Katja Kipping called on the opposition Greens and Social Democrats — currently in Merkel's federal coalition — to forge a "progressive" alliance. Fellow chair Bernd Riexinger warned Left party members that a further "swing to the right would change this country." Markus Söder, newly elected premier of Bavaria's governing Christian Social Union (CSU), which is allied with Merkel's CDU, said Germany must clearly understand that the AfD was on the "outer far-right."